Congratulations to our First Good Student Award Winners of the 2017-18 School Year: Rebecca Olson of Fosston and Mark Hastings of Hillsboro! 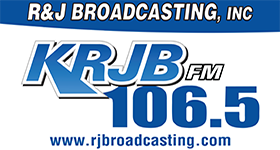 You will be available to hear those interviews this Saturday at 8:45am on KRJM, KRJM, and KKCQ! The deadline for nominations to be considered for the next week's Good Student Awards is Noon on Monday, September 18th. Please feel free to send in nominations at any point during the week for the next week's awards.